I have only been a few hours in this City of Dreadful Dirt, so you must not take my first impressions seriously I feel like being funny3. I began to feel good as soon as I got east of Chicago4. When I got to where there were some hills and clear streams and trees the Lord planted I did'nt need any mint julip. The conductor saw my look of glee and asked if I was "gettin' back home." Mr. Axtell5 met me and timidly approached me. I did not think he could be the man and at first repulsed him with scorn. He was exceedingly cordial and brought me right out home6. They live in a beautiful on part of the city where the hills are all built up with big ivy-grown houses that are beautiful to see. When we entered the parlor my heart sank. It is one of the hair cloth furniture kind and its only ornament was a huge [illegible] crayon portrait of Grandpă7!! But the library is much better. It also contains a picture of grandpă, but there are also novelists of the milder sort and I saw Mrs. Axtell8 reading Harpers9, which is encouraging. Now for the sad news, the Puritans maid10 is not at home. She is over in Wainsburg11 visiting "aunt somebody" and being coached in Greek preparatory to going to Vassar this fall—not Wellesley—So they say, but I secretly believe they sent her away to th save her from my contaminating influence. I am rather glad she is not here, it will give me a better chance to get on to my new role. The room I have must be hers, I think as it contains 2 three bibles12. Of course she took three with her, so that makes six. Alas! 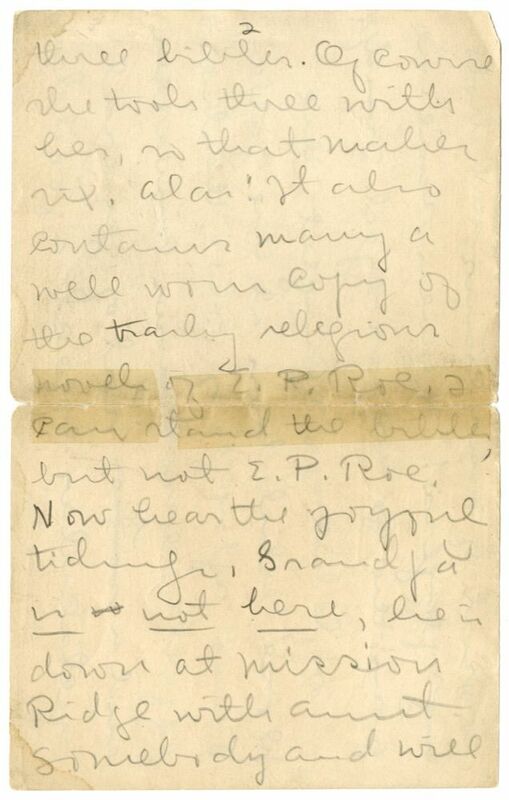 It also contains many a well worn copy of the trashy religious novels of E. P. Roe13. I can stand the bibles, but not E. P. Roe. Now hear the joyful tidings, Grandpă is is not here, he is down at Mission Ridge14 with Aunt Somebody and will 3 probably remain there the rest of his natural days. They say the climate suits him, may it continue to do so! for I feel that the stern eye of Grandpă, so accustomed to detecting the follies and foibles of this world, won't would penetrate me thin disguise as the of old sage15 did Lamia's16, and he would cry out "I see her, the devotee of French fiction, the consort of musicians and strolling players!" Heaven save me from the gr Argus-eyed17 grandpă. In Chicago I caught the Doré18 exhibition at the gallery19. Great splurges of color, theatrical effects, enormous canvases and a sot o sort of general spectacular effect a good deal like the "Last Days of Pompeii"20 bill boards. 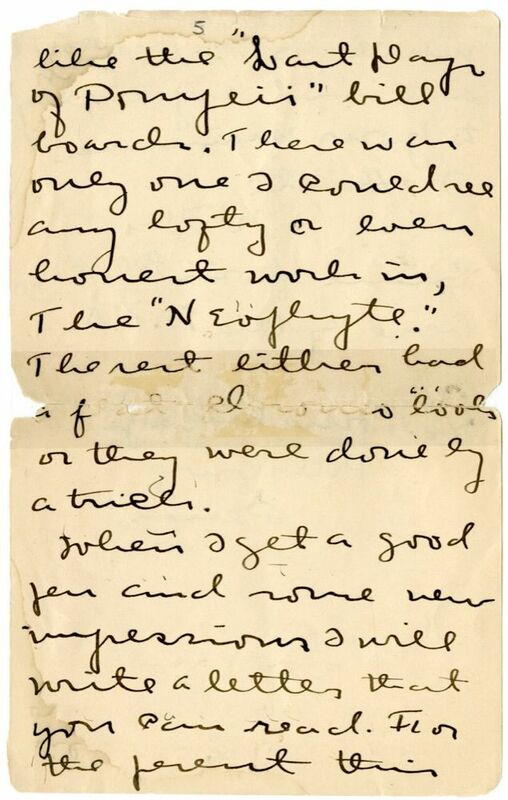 There was only one I could see any lofty or even honest work in, The "Neophyte. "21 The rest either had a flat chromo looks or they were done by a trick. When I get a good pen and some new impressions I will write a letter that you can read. For the present this must do. Love to all and especially to your Mamma22. Came from Chicago here by the B. &. O.
c/o Home Magazine23 Pittsburg Penn. 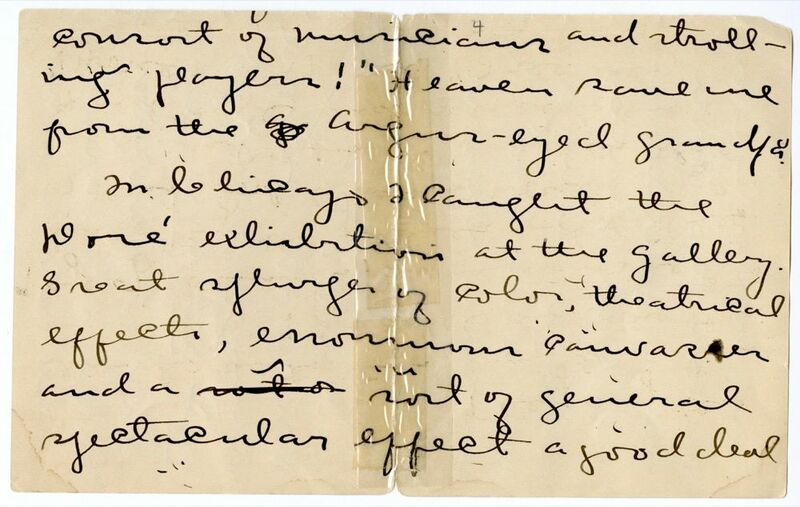 Document is four leaves, handwritten on recto and verso of each leaf. 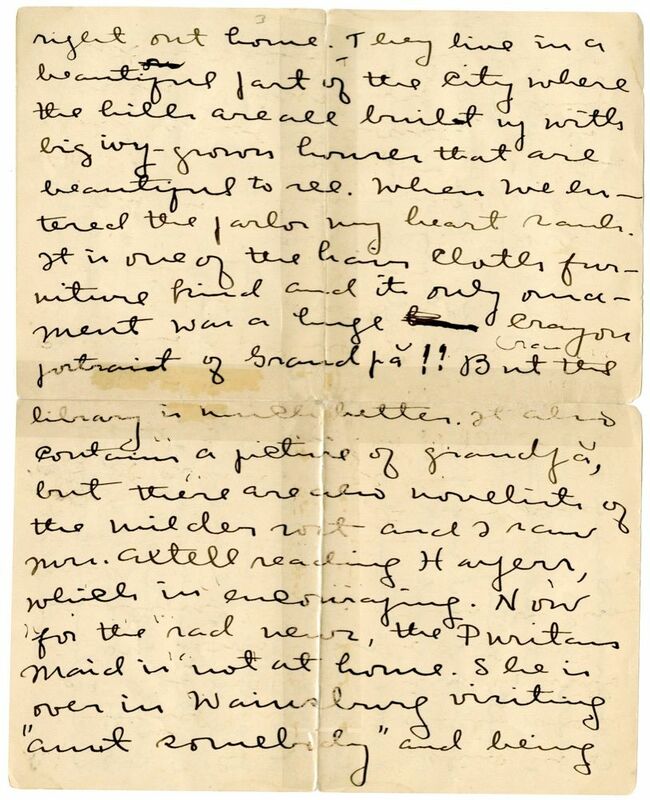 Internal evidence suggests that this letter was written on June 26, 1896, the day Cather arrived in Pittsburgh, PA. 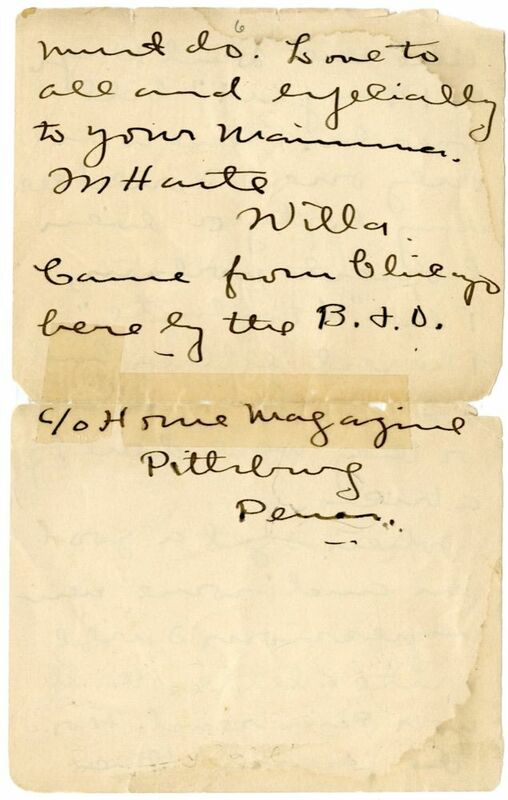 According to Kari Ronning's chronology, the Red Cloud Golden Belt newspaper reported on June 26, 1896, that Cather left for Pittsburgh on June 23, 1896 (the previous Tuesday). 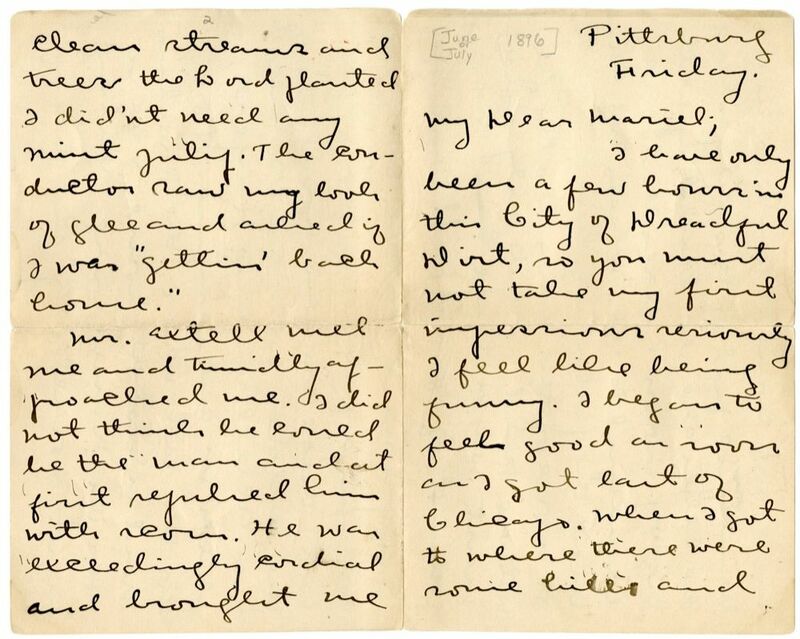 This letter is datelined "Friday" and Cather says she has only been in Pittsburgh for "a few hours," so it must be the first Friday after her arrival, hence June 26. Cather is alluding to the poem, "The City of Dreadful Night" (1874) by James Thomson. The Axtells lived at 6338 Marchand Street in the Shadyside neighborhood in Pittsburgh, PA.
Apollonius, a character in John Keats' narrative poem Lamia, exposes Lamia as a serpent disguised as a woman at her wedding feast. In Greek mythology, Argus Panoptes is a many-eyed giant. The Art Institute of Chicago exhibited Work by Gustave Doré: The Doré Gallery Collection from January 21 to October 5, 1896. Axtell, Philip (1815-1897). Presbyterian Reverend in Pittsburgh. 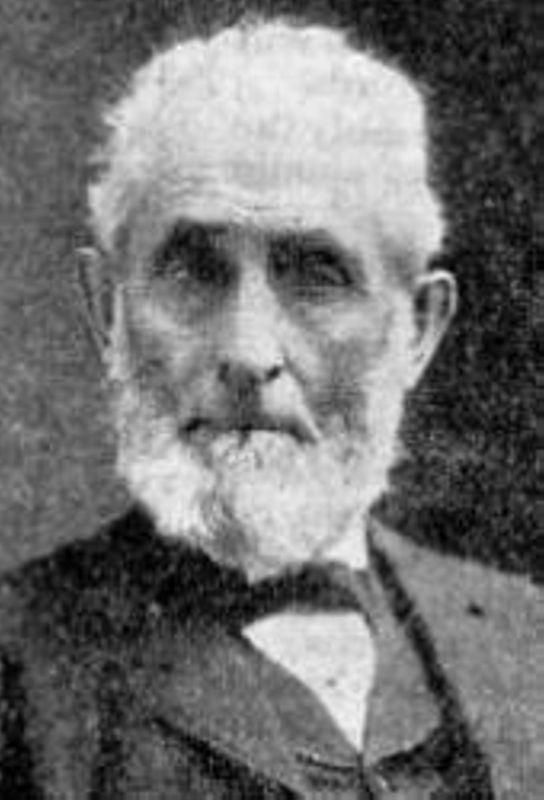 Born in 1815 in Morris Township, PA, to Luther Axtell and Nancy McClain Axtell, Philip Axtell attended the Green County Academy at Carmichaels and became a Presbyterian minister in 1839. 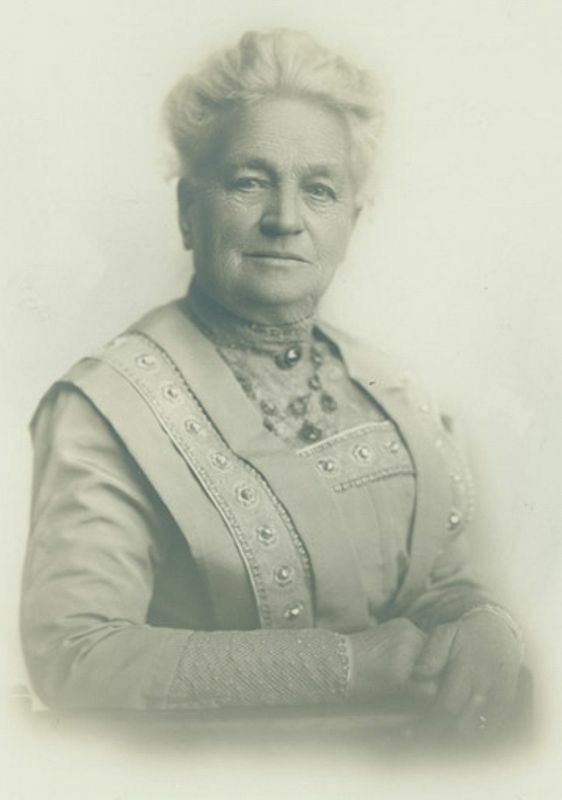 He married Eliza Gibbons in 1843, and the two had five children: Ann, Mary, James, Lydia, and John. Reverend Axtell established several Presbyterian churches throughout Green and Washington Counties in Pennsylvania, among them the Cumberland Presbyterian Church on Shady Avenue in Pittsburgh, PA, which his family attended. Roe, Edward Payson (1838-1888) (“E.P.”). American novelist. Born and raised in Moodna, NY, Roe attended Williams College and Auburn Theological Seminary. Working as a chaplain and a pastor, in 1874 he began his career as a writer of popular novels and writer of books on religion and morality. 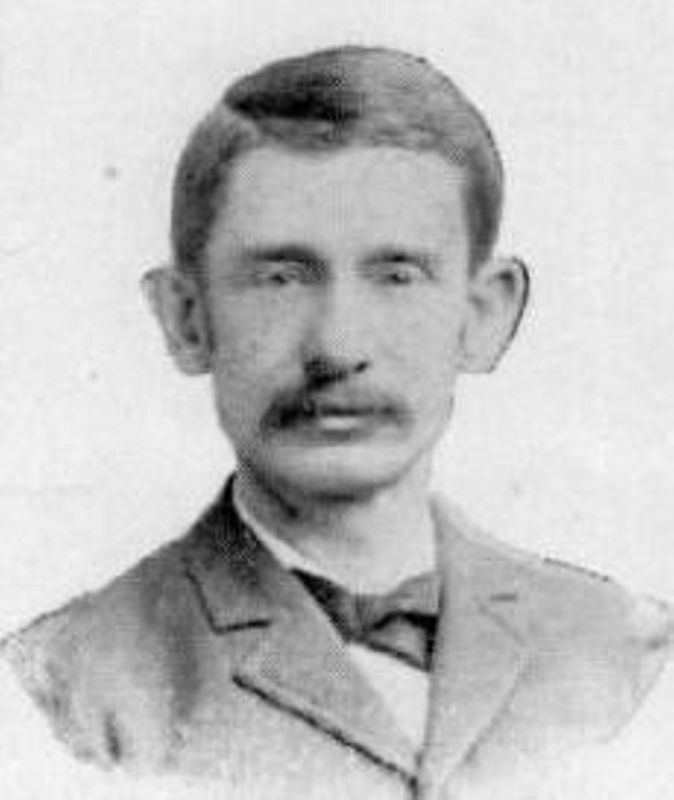 His novels included: Barriers Burned Away (1874), Opening a Chestnut Burr (1874), and He Fell in Love with His Wife (1886). 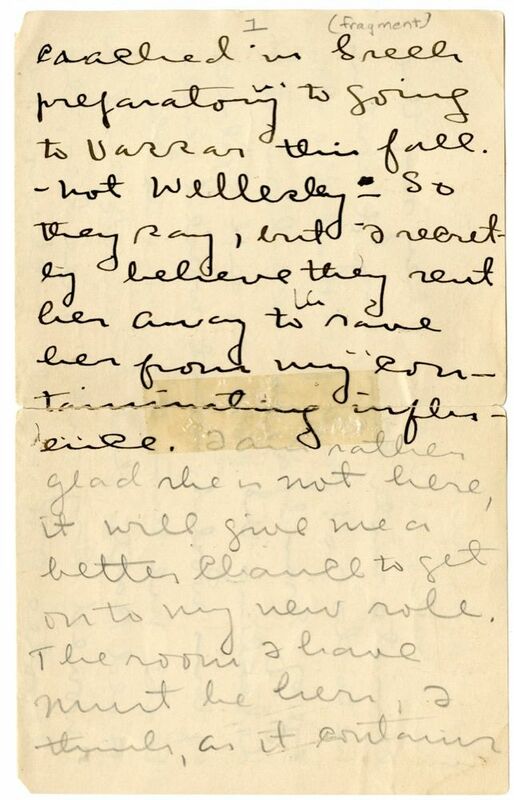 Cather disparaged his work, considering it “trashy” (#0025). Doré, Gustave (1832-1883). French printmaker and illustrator. 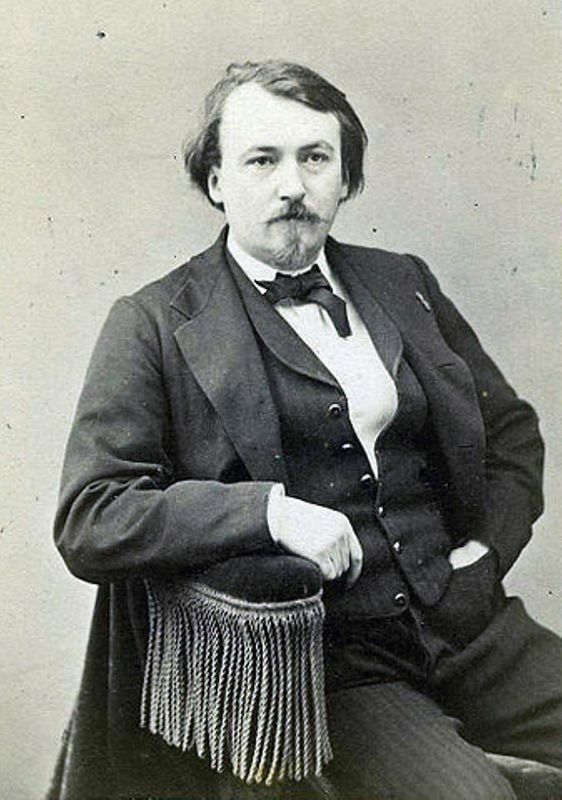 Born in Strasbourg, France, Doré was reputed to be a child prodigy. He went to Paris around 1845 to study at the Lycée of Bourg-en-Bresse and later at the Lycée Charle Magne. At fifteen he began to produce weekly lithographic caricatures for the Journal pour Rire. Doré also painted in oil but is best known for his wood-engraved book illustrations. He illustrated over 90 books including: Oeuvres de Rebelais (1854), Balzac’s Les Contes drolatiques (1855), Dante’s Inferno (1861), and a large folio Bible (1866). 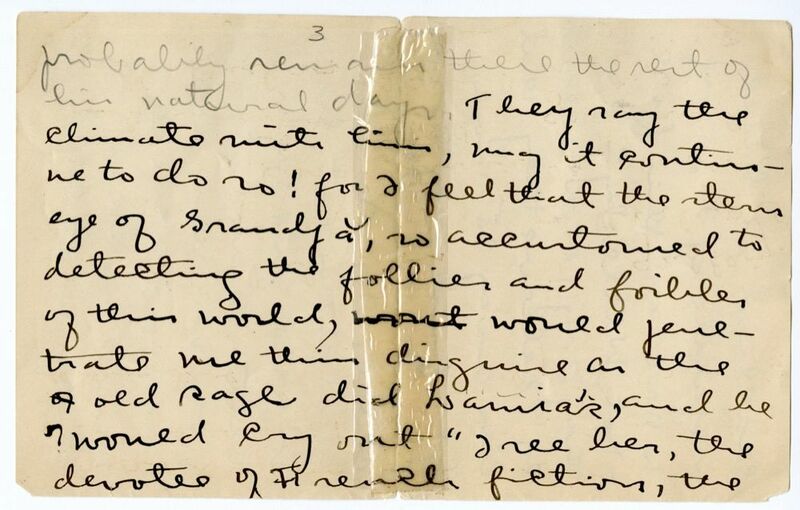 Cather saw an exhibit of his oil paintings in Chicago in 1896 and was not impressed.